A place for relaxation, recreation & the opportunity for adventure! ALL information you need to make a successfull vacation in the swedish mountains is found on our Website, in English. On the website you find detailed information about the cabin, surrondings and activities: hiking trails, skiing trails and tracks, fishing, lots of photos, useful lincs and maps. The cabin lies on 700 meters altitude in northern Dalarna. It is close to nature reserves with beautiful hiking and skiing possibillities – an area with mountain peaks 1100 meters above sea level, glittering lakes and old forests. Städjan-Nipfjället among other mountains. It's also close to one of Dalarnas best ski slopes. ACCOMODATION – 5 beds, sauna & fireplace in a cosy atmosfere. After a day with hiking or skiing you can relax in front of the fireplace or in the sauna. Gather in the evening sun and barbecue. You have the place for yourselves. A step from the cabin you will find yourself in a beautiful old forest where the night sky's stars and the northern light gives a moment of contemplation. The main cabin (70 sq m) is comfortable and well equipped: Light renovated kitchen with electric stove/oven, wood fired stove, fridge, microwave oven, kettle, coffee machine and more. Cosy living room with fireplace and a spacious sofa. Several games and a smaller library. Cosy upper floor with double bed, three sleeping lofts, pool table, sofa and table. Toilet with shower. Entrance with drier/shoe-dryer and storage for clothes/shoes for the large family. Outlet for motor heater available. Guest house: Timbered guest cabin (12 sq m) on the yard for those wishing to be secluded. There you have a fireplace, electric heating, dining table, bunk bed, stove with two hotplates. From the garden shed you can borrow sledge and rods. Sauna: There is a big woodburning sauna on the yard. For more info about the sauna, see our website below. SUMMER – Hiking and fishing. The cabin lies secluded with miles of unspoiled wild wood with key biotopes, reserves and different mountains. It's close to Städjan-Nipfjället and Vedungsfjällens nature reserve, which has Dalarnas second highest peak. You're able to make beautiful hikes and a peak climbing with view towards Norway. Our guests use the cabin as a base also for trips to Dalarnas highest mountain in grövelsjön, trips to the worlds oldest tree and Sweden's highest waterfall on Fulufjället. Are you searching for detailed info about hiking possibillities and maps? Check out our website! WINTER - Skiing on the slopes, winter trails & cross country tracks. Some of Dalarna best slopes are within easy reach, such as Fjätervålen Ski Resort and Idre Fjäll. With the combined ski ticket "Idrepasset" you can ski on both places. The surrounding nature reserves, Städjan-Nipfjället and Vedungsfjällen, offers crossmarked winter trails with beautiful views. SURROUNDINGS - High mountains and deep valleys. The cabin is situated in the peaceful and secluded village Häggberget in northern Dalarna, between Städjan-Nipfjället and Vedungsfjällens nature reserve. 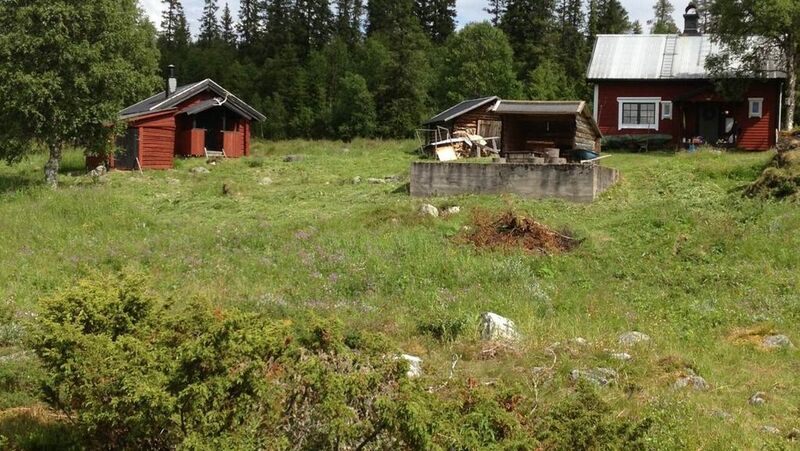 The yard lies open, next to an old pasture, with view towards the watercourse Storfjätan. You might bee able to see elk, fox, dears, traces of beaver and wolverine. Me and my husband Åke and three boys love hiking in the nature. If you want to stay at a cosy ackomodation on a calm secluded place close to beautiful old forest and wich to have the wildernes outside the cabin. This is the place for you! The cabin lies on 700 meters altitude in northern Dalarna. It is close to nature reserves with beautiful hiking and skiing possibillities – an area with mountain peaks 1100 meters above sea level, glittering lakes and old forests. It's also close to one of Dalarnas best ski slopes. The woodstove in the livingroom has a front made of glass. The most common spices are available in the house. Take what you need and pay for what you think it's worth. Se detailed info on the cabins website. Wood burning sauna. One box of wood is included in the rental price (you can easely buy more if you need). See detailed information about this wonderful sauna on the cabins website. We stayed one week during the winter and were excited over the big amount of snow! The house is quite far from the next village/city, which we liked a lot. During the nights you could see so many stars. There are many possibilities to get active (ski areas, national parks, husky tours etc). We saw our first moose and reindeers, full success. The house itself is cozy and comfortable and beautifully furnished. It is clean and equipped with everything you need. We also liked the opportunity of getting wood out of the wood shed to heat up the sauna and the fireplace. The house is not a luxurious new built vacation house (who needs that anyway), but a family owned house with a lovable character. The landlord Maria was very friendly and dedicated to help us have a great vacation. It is located in very beautiful surroundings and we are very satisfied with our stay here. The facilities are clean and the sauna is fantastic. This house is perfect if you want to enjoy nature and skiing. The slopes are just 15 min away. Communication with the owners was great! Perfect for skiing, hiking and fishing. The sauna is great! A calm and quiet stay in a cosy, old but modernised cottage, below the mountains. Wir verbrachten bereits letztes Jahr zwei Wochen und in diesem Jahr eine Woche in diesem liebevoll eingerichteten Haus. Die Ruhe und Abgeschiedenheit, die herrliche Landschaft mit unzähligen Wandermöglichkeiten, sowie die vielfältig zu beobachtende Tierwelt hat uns auch dieses Jahr wieder begeistert. So konnten wir Fisch, Stein- und Seeadler, einige Elche, viele Rentiere und als absolut unübertreffbares Erlebnis einen Bären beobachten. Das Haus bietet alles was man braucht um sich nach anstrengenden Wanderungen zu erholen. Die Gastgeberin ist sehr freundlich und wir stehen auch weiterhin in Kontakt. Thank you for those words! It's great to hear that you had a wonderful holliday. Warm welcome back! The cabin has a lot of charm and is comfortable for up to 4-5 people, although the bathroon is quite small. That is not so important as there is a wonderful wood-fired sauna for relaxing after a day out hiking, fishing or skiing. The listing is pretty accurate and there is a lot more information about things to do in a folder in the cabin. The tips we tried were good. We were there to experience the mountain surroundings, which are great. It is relatively remote with only a few other buildings within a couple of km but that is what we wanted. It is off the beaten track, but the instructions to get there worked fine and everything was as described. We spent a wonderful week here this past winter. Really beautiful and quiet surroundings. The sauna was fantastic- would go back just for that! Relatively close to Fjätervålen, where we enjoyed some cross-country skiing. Our host was quick at responding to emails and was very thorough in giving us all the information we needed for our stay. The cottage is very isolated, and that's just what we wanted. (Do stock up on groceries in Idre on your way! There is a small shop at the ski resort in Fjätervålen as well.) While winter visit is just perfect, we look forward to visiting sometime in the summer as well.